For the past eighteen years Senegalese and American performers have been using their music, their dance, and their performance poetry to illustrate the guiding principle of their Senegal-America Project: “we are all connected.” Their educational programs have reached half a million students in Senegal and America; their partnerships have delivered 3500 mosquito nets and essential medicines to at-risk neighborhoods, and their concert performances include appearances at Senegal’s National Theatre, at The Clearwater Jazz Festival, at Dakar’s CISES Concert Hall, at NYC’s Blue Note and at Baaba Maal’s Festival les Blues du Fleuve. 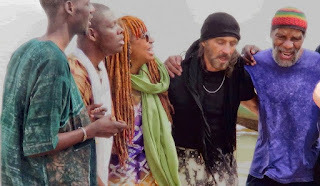 In 2012 the US Embassy awarded a grant to bring the US contingency to Senegal for performances, workshops and collaborative recordings. Over the last nearly two decades work visas have been granted to ten Senegalese performers to perform and teach in America. They’ve produced two CD recordings and each is a daring blend of music that is ancient and contemporary, traditional and innovative, African and American. Right from the beginning Northampton was the project’s US home base. So be ready for spectacular World Music and drumming, amazing dance, and cutting edge poetry.. Proceeds of the concert will support the project’s school programs and partnerships, festival appearances, and fair trade collaborations in Senegal and America.